It's the time of year when we think about getting chicks to expand our flocks, so consider these breeds that need our love and attention to survive. 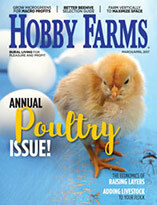 February might mean Valentine’s Day to many people, but to poultry keepers it’s time for a different kind of love. We spend our spare moments leafing through hatchery catalogs, visiting breed-club websites and daydreaming about peepers populating our coops. I adore baby chicks and, if I could, I’d get a half dozen of every single variety on my wish list. 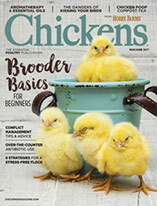 Are you mulling over which spring chickens to add to your flock? Consider helping the heritage-livestock conservation efforts by selecting from these five critically endangered standard breeds. This eye-catching black bird (illustrated in the photo above) sports a fluffy beard and crest, but its most noticeable feature is its striking V comb. One of France’s oldest breeds, the Crevecoeur has been documented as early as the 1700s and was admitted to the American Poultry Society in 1874. Small and active, with calm temperaments, Crevecoeurs are well suited for families with children and adapt well to most climates. Crevecoeurs are dual-purpose chickens, producing deeply dark leg meat and remarkably white breast meat. They adapt to most climates. The hens lay medium white eggs and rarely go broody. 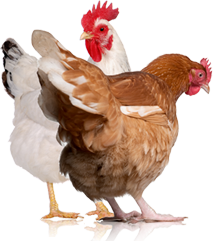 An excellent selection for poultry keepers with limited acreage, Hollands are excellent foragers who scavenge for a considerable amount of their food. Despite their slow growth rate, Hollands are docile, dual-purpose birds that will produce plenty of medium-to-large white eggs. The hens can go broody and will sometimes rear their own chicks. 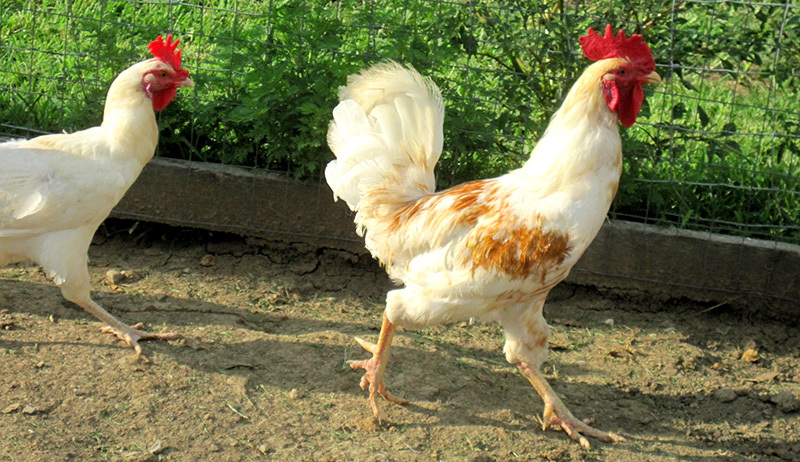 Of the two varieties, the White Holland is believed to be extinct, while the Barred Holland is considered the rarest breed of American chicken. Raised for generations in central England, the Redcap is easily recognized by its massive rose comb, which extends over most of the bird’s head and gives the breed its name. Alert and active, the Redcap is an extremely self-reliant bird best suited for free ranging and foraging. Despite its wild tendencies, the Redcap was a favorite with egg farmers in the early 1800s because of its high rate-of-lay: Hens produce a profusion of large white eggs, the only red-lobed chicken to lay white. By 1900, however, the breed had almost vanished. This disappearance is commonly credited to the Redcap’s feral-looking feather pattern—red plumage spangled with blue and black—which does not fully emerge until the adult bird’s second or third year. One of the earliest recorded show birds, the Spanish chicken was the darling of poultry exhibitions in England and the United States during the early to mid-1800s. Its chalk-white face, striking against its black feathers, made the Spanish a highly sought-after breed among poultry fanciers. This very trait also led to the bird’s demise, as breeders sacrificed hardiness for an increasingly prominent white face. The resulting delicacy led to the Spanish being passed over for more rugged, robust varieties. Spanish hens are excellent, non-setting layers, producing a bountiful number of jumbo white eggs. Bred as an ornamental fowl in its native Turkey, the Sultan features an assemblage of unusual traits found in other chicken breeds. It sports a crest like a Polish, a beard and muff like an Ameraucana, a V-shaped comb like a La Fleche, feathered shanks and toes like a Cochin, and five toes per foot like a Silkie. The Sultan stands erect yet holds its wings drooped, like a Serama. Its calm, content nature made the Sultan popular with American breeders in the late 1800s, but its all-white plumage made it popular with predators, leading to its plummeting population. Sultans are stay-at-home birds, preferring feed and grains to foraging. The hens lay large white eggs; they do not go broody. What Makes a Breed Critically Endangered? The Livestock Conservancy, a national organization that strives to protect endangered livestock and poultry breeds from extinction, releases its Conservation Priority List every year. This list identifies heritage breeds that are critically endangered or threatened, are in recovery, bear watching or are of interest. Currently, 11 chicken breeds are classified as critically endangered. This means that, for each of these breeds, fewer than 1,000 birds exist throughout the world, with five or fewer primary breeding flocks in existence in America.